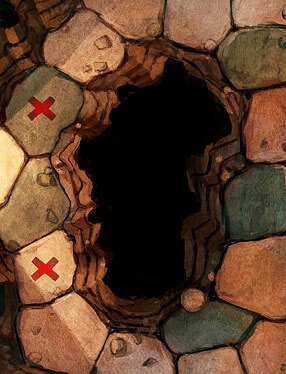 Chapter selection: Choose a chapter from a Mice and Mystics story book. Depending on how many people are playing, some players may need to choose and control more than one mouse so that the correct number of mice are in the adventuring party. 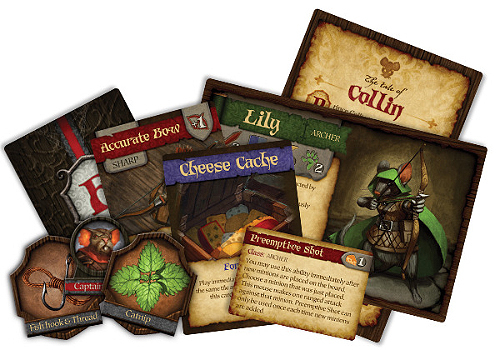 Choose a hero: Each player chooses their mouse hero (or heroes) and collects that mouse's hero card, initiative card, and figure. The chapter being played will tell players how many mice are going to be adventuring in that chapter (usually four). Choose an ability: Players choose 1 ability card for each mouse that they are playing. Make sure a mouse meets the class requirements for the ability that is being chosen. Gather equipment: Find the search cards that are indicated on each mouse's starting setup and equip them to that mouse. Refer to the 'Party Setup' section of the chapter for any extra cards or party items that the adventuring party should start with. Set up the board: Place the room tiles in the middle of the playing area as shown in the 'Room Tile Setup' section of the chapter being played. Be sure to place the tiles so that their arrows (located in a corner of each room tile) are all pointing in the same direction. Place figures: Place the mice figures and any minion figures on the board as directed in the 'Room Tile Setup' section of the chapter being played. Determine initiative order: Shuffle the initiative cards belonging to each mouse and minion that is on the board at the start of the chapter and determine the starting initiative order. Set up the story control board: Place the story control board to the side of the playing area. Place the hourglass marker on the first page of the chapter track and the chapter end marker on the page noted in the 'Chapter End' section of the chapter being played. Shuffle the remaining search cards and form a search deck on the search area of the story control board. Refer to the 'Encounter Deck Setup' section of the chapter being played for details on how to setup the encounter deck for that chapter. Additional items: Place the cheese tokens, the minion figures, any remaining initiative and ability cards, and a pile of all other tokens off to the side of the playing area within reach of the players. Follow any chapter specific instructions: Follow any further setup instructions as noted in the 'Chapter Setup' section of the chapter. 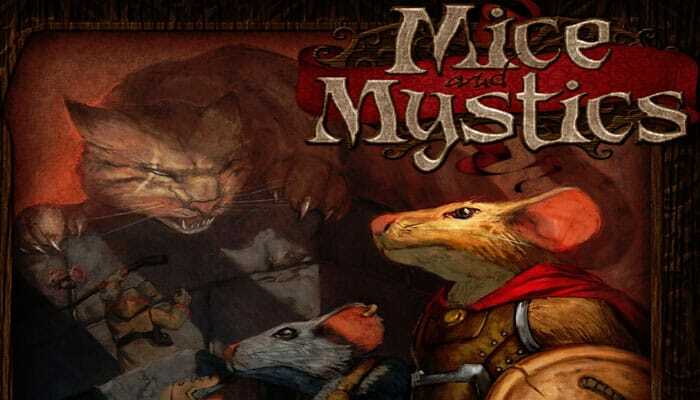 Mice & Mystics is a cooperative adventure game for 1-4 players. Players take on the role of adventuring mice. Using teamwork, courage, and a little luck, the mice will explore their way through a series of interactive chapters as their story unfolds. 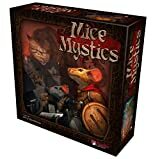 Mice and Mystics is played over a series of rounds. Each round is made up of turns. The first turn of a round is taken by the card that is highest on the initiative track. The next turn is taken by the next highest card on the initiative track, and so on. Once the last card on the initiative track has taken a turn, a new round begins. When an initiative card comes up in the initiative order, all figures that the card represents will share that turn but will take their actions separately. To determine in which order the mice and the minions will take their turns, players must first determine an initiative order. At the beginning of a chapter, and each time a new encounter card is revealed, initiative order must be established. Take the initiative cards for each mouse and each minion type that are going to be on the board at the start of that encounter and shuffle them together to create an initiative deck. Then, one at a time, take each of the cards from the initiative deck and place them face up along the initiative track that runs down the side of the story control board. Place the first card on the 1 spot, the second on the 2 spot, and so on until all cards have been placed. Simply shuffle up the initiative cards for the new minons that are going to be added and place them on the next available slots on the initiative track. If new minions that are being added already have an initiative card on the track, there is no need to add another initiative card to the track for those minions. Note: If there are ever more initiative cards than available slots on the initiative track, follow the normal placement rules for initiative cards and simply allow the extra cards to temporarily extend the track. If a boss minion has more than 1 initiative card, when that boss is going to be placed on the board randomly choose 2 of that boss's initiative cards to be added to the initiative track. That boss will take a turn for each initiative card they have on the track. If there are already minion cards on the track when adding a boss minion that has multiple initiative cards, place both cards at the bottom of the initiative track as usual, then follow the ambushing rules for the first of those two initiative cards. When all of the figures associated with an initiative card are no longer on the game board, remove that card from the initiative track and move up all other cards to fill in the gap. Each free action can only be performed once during a mouse's turn. A free action cannot be performed in the middle of performing another action. A mouse can only use one ability card per turn, even if that mouse has multiple abilities that are free actions. Choose wisely! At the start of a mouse turn, the player controlling that mouse must roll an action die. 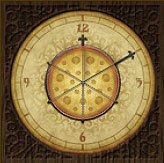 Among other symbols, each die face has a number printed on it ranging from 1- 3. Add the number rolled on the action die to the mouse's move value to determine the number of spaces that mouse can move on that turn. Example: Prince Collin has a move value of 2 and rolls a 1 on the action die. Prince Collin can move up to 3 spaces on that turn (2+1). The spaces in this game are not all the same size and shape, and some spaces even have small gaps between them. To determine if spaces are adjacent, follow this rule of thumb: if the base of a mouse figure can bridge the gap between two spaces, they are considered adjacent. Moving a figure between those two spaces counts as having moved 1 space. There are a few larger areas in the game that aren't broken into smaller spaces. (Areas like the counter in the Kitchen, the table in the Dining Hall, and the bed in the King's Chamber). These areas are called - special area spaces. Special area spaces do not follow the normal rule of 4 small figures or 1 large figure per space. Instead a special area space may contain as many figures as you can physically fit into the surface area of that space. Each yellow line that divides two spaces is marked with an arrow that points in one direction. Crossing a yellow line against the direction of that arrow costs 3 spaces of movement. Crossing a yellow line with the direction of that arrow costs the usual 1 space of movement. Spaces divided by a yellow line are considered adjacent to one another. Mice cannot move from one space to another if they must cross a red line to do so. Spaces divided by a red line are not considered adjacent to one another. There are areas on some of the room tiles that are colored completely black. These areas represent solid rock. These areas can never be moved onto or through by any means. There are also areas of the tiles that are a graphical representation of a wall. These areas are not treated as spaces and can never be moved onto or through by any means. There is one exception to this rule. On the Pipes tile, the dark areas are representative of gaps between the pipes. These can only be moved through by using items that let a mouse cross over red lines, such as the Fishhook and Thread or Levitate Scroll. 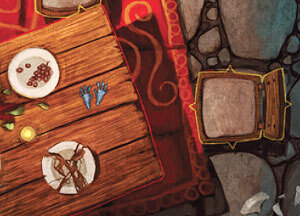 The various room tiles also have a number of graphical features, such as crystals jutting up from the ground or plates of discarded food. Any such features are not considered to be their own spaces, but are either part of the space they are within, like in the case of the skull in the Alchemist Chamber or the helmet in the Guardroom, or in-between spaces, like in the case of the crystals in the Crystal Tunnels. Board features in-between spaces can only be moved through if they fit the rule of thumb for moving between spaces described earlier. Up to 4 small figures can occupy the same space. However, a large figure (such as a spider or centipede), takes up a full space. A space is considered to be full when it has 4 small figures or 1 large figure on it. A mouse or minion cannot move onto or through a space that is full. When a mouse moves onto a space occupied by a minion, the mouse must end its move. If a mouse starts its movement in the same space as one or more minions, that mouse can only move out of that space if the number of mice (before moving) is equal to or greater than the number of minions in that space. When a mouse moves onto water, even from another water space, it must end its move. When a mouse attempts to move onto a non-water space from a water space, it must use its entire move to do so. That mouse's player must roll an action die for that mouse and every mouse on the destination space. If at least 1 symbol is rolled, the mouse has successfully climbed out of the water. Place the mouse on the destination space. If a symbol is not rolled, the mouse does not move. Some water also has a current, signified by directional arrows somewhere along the path of that water. A mouse moving in water, cannot move against the direction of the current. At the end of a mouse's turn, if that mouse is in a water area that has a current, move that mouse one space in the direction of that current. If this carries a mouse off of the room tile, that mouse is captured. Note: Because they are fighting against the current, mice cannot use free actions when on water spaces. Minions are not affected by water spaces in any way. When a mouse moves on a mousetrap, it must pause its movement to find out if it has sprung the trap. Roll a number of action dice equal to that mouse's move value. If the mouse is a tinkerer, a player can instead roll a number of action dice equal to its lore value. If at least 1 symbol is rolled, the mouse safely passes over the mousetrap and can continue moving. If no symbols are rolled the trap has sprung and the mousetrap is removed. The mouse takes 1 wound, collects 1 cheese token, and is knocked down. Whenever a mouse springs a trap, its turn immediately ends. Minions are not affected by mousetraps. If a mouse has already moved, it can use a scurry action to move again. To scurry, simply roll the action die and move again using the new roll result. All normal movement rules apply when using the scurry action. 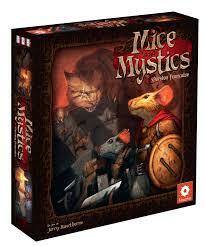 Players will roll action dice to make attacks in Mice and Mystics. There are a number of relevant results: sword symbols, sword/shield symbols, bow symbols, and cheese symbols. When defending against an attack, only the sword/shield symbols and the cheese symbols are relevant. Whenever a player is attacking or defending with a mouse, if one or more cheese symbols are rolled, that mouse gains 1 cheese token for each cheese rolled. If a mouse is armed with a melee weapon, it can perform a melee attack. To perform a melee attack, first choose a target by selecting a minion that is on the same or adjacent space as the attacking mouse (see movement rules for determining adjacency). Then roll a number of action dice equal to that mouse's battle value. Remember to add any bonuses that the mouse's items or equipped weapons might give it. Add the number of sword and sword/shield symbols rolled for that attack. This is the number of hits the mouse has inflicted. If a mouse inflicted one or more hits, the player to the left of the active player rolls defense for the targeted minion and adds the number of sword/shield results rolled. For every sword/shield rolled, that minion blocks one of the attacking mouse's hits. Each hit that goes unblocked inflicts one wound on the targeted minion. Whenever a player is attacking or defending for a minion, if 1 or more cheese symbols are rolled, add one cheese token to the minion wheel on the story control board for each cheese rolled. If a mouse is armed with a ranged weapon or spell, it can perform a ranged attack. Ranged attacks are performed in the same way as melee attacks, except each bow symbol counts as a hit instead of the sword or sword/shield symbol. Also, when selecting a target for the attack, a player can select any minion on the same room tile as the attacking mouse as long as that mouse can 'see' the target. However, if there are minions in the same or adjacent space as the mouse, one of those nearby minions must be selected as the target of the attack. To determine if a mouse can see a target for the purpose of a ranged attack, draw an imaginary line from the center of the space the attacking figure is on to the center of the space the targeted figure is on. Use the edge of a card or this rulebook if necessary. If the imaginary line passes through any black areas or walls, then the attack or spell cannot be used. 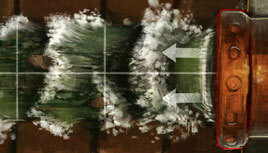 Additionally, there are some board features that may give the impression that they would block line of sight. Players can determine among themselves which of these features should block a mouse's line of sight. When 1 or more wounds are inflicted on a non-boss figure, refer to its initiative card. If the figure's initiative card shows that it only has 1 life, that figure is defeated. Remove it from the board. If the defeated figure was the last figure an initiative card represented, remove that initiative card from the track as well. If the figure's initiative card shows that it has more than 1 life, place 1 wound marker on that figure's initiative card for each wound it received. When a multiple life figure has a number of wounds on its initiative card equal to or greater than its life value, that figure is defeated. Remove it from the board and remove its initiative card from the track. Boss minions normally have multiple initiative cards on the initiative track. Each time a mouse inflicts a wound on that boss, choose which initiative card to place the wound on. When a boss initiative card has a number of wounds on it equal to or greater than its life value, remove that initiative card from the initiative track. Once the last initiative card for a boss has been removed from the track, remove its figure from the board as well - it has been defeated. To perform a search action, a player must announce that his or her mouse is searching and roll an action die. If a symbol is rolled, that player draws 1 card from the top of the search deck. immediately discard it for 1 cheese. If it is an event card, follow the directions on the card. Once a mouse successfully searches, the mouse cannot search that same tile again. If a mouse is stunned or webbed, it can use a recover action to get rid of this negative effect. When a stunned mouse performs a recover action, remove the stunned marker from its initiative card. When a webbed mouse performs a recover action, roll an action die. If a symbol is rolled, remove the webbed marker from the mouse's initiative card. The explore action is the normal way that the mice will move from the room tile they are on to a different room tile. An explore action can only be performed when there are no minions on the same room tile as the mice. There are 2 types of spaces on which a mouse can use an explore action: a space adjacent to an exit area, and a flip space. When a mouse is on a space adjacent to an exit area, it can use an explore action to attempt to move to a new tile. In order to move to a new tile, that new tile must have an exit area of the same color aligned with the exit area to which the searching mouse is adjacent. These two tiles are properly aligned. A mouse can use an explore action to move from the first tile to the other. There are 2 sides to every tile: a blue side and an orange side. If the tile the mouse is moving to has a different color of side facing up than the tile the mouse is on, flip over the tile that the mouse is moving to, keeping its orientation arrow facing in the correct direction. If there is no exit aligned on the appropriate side, the mouse cannot explore over to the new tile. When a mouse successfully performs an explore action to move to a new tile, that mouse and all of the other mice on the same tile are immediately placed on a space adjacent to the exit area on the new tile. When a mouse performs an explore action on a flip location, remove the mice from the room tile and flip it over, keeping the arrow on the flip side in the correct orientation. Then place all of the mice on the flip location located on the newly revealed side of the room tile (or an adjacent space if there are more than 4 mice in the party). This flip location can only be explored when the party has the Fishhook and Thread token available. A flip location marked with this symbol can only be explored by a tinkerer or scamp. Each time a mouse explores an area that has not already been explored during that chapter, the mice will have an encounter. Unless otherwise stated in the chapter being played, draw a card from the encounter deck. Each encounter card has multiple potential encounters based on how far the chapter has progressed. Use the encounter that matches the page space that the hourglass marker currently occupies on the story control board. Place the new minions using the placement rules, then determine an initiative order. Once the minions are placed, place the encounter card face-up on top of the encounter deck. If there is still an encounter card face up from a previous encounter, discard the old card. This new face-up encounter card will now determine the next non-chapter-specific surge effect. Place all small minions that have range on the minion entry space that is furthest from the mice. Players choose which space to use if multiple options are available. If there is a special area space bordered in red that has a minion entry space on it, place the ranged minions there instead. If the chosen space becomes full, choose a new space to place the remaining minions following the same rules. One at a time, place any large minions on the empty minion entry space that is closest to the mice. Players choose which space to use if multiple options are available. One at a time, place all small melee minions on the remaining available (not full) minion entry spaces. Players choose which spaces to use if multiple options are available. Try to spread these melee minions out as much as possible. Whenever new minions are added, their initiative cards must be added to the initiative track. 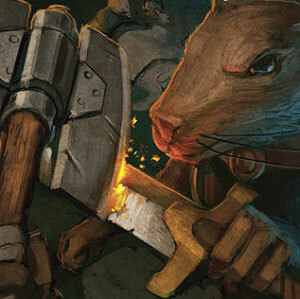 There are 4 Elite Rat Warrior tokens and 1 Captain Vurst token included in the game. If an encounter or chapter calls for elite rat warriors to be placed, use the rat figures but add the Elite Rat Warrior tokens under the figures to show that the newly added rats are actually elite rat warriors. Follow the same rule for Captain Vurst. 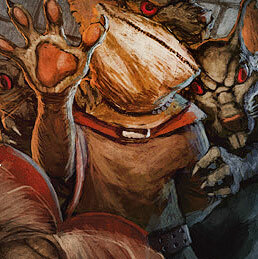 If the encounter calls for rat warriors, use the rat figures without any tokens added underneath. Some encounter cards include the word 'Mousetraps' near the top of the card. When an encounter includes a mousetrap, place 1 mousetrap marker on each space of the current room tile that is marked by a red 'X' symbol. For rules on how mousetraps work. Some encounter cards include the word 'Ambush' near the top of the card. When determining initiative order for an ambush encounter, first place all minion cards onto the initiative track normally. Then roll an action die for each minion initiative card on the initiative track, one at a time. Move that card up on the initiative track a number of spaces equal to the number rolled on the die, scooting the cards below it down to make room. Ambushes do not affect the surge minions for that card. Some encounters include 'greedy roaches'. Greedy roaches use the same initiative card as normal roaches. When greedy roaches are placed on the board, all roaches in play become greedy roaches. When a greedy roach steals a cheese from a mouse, that cheese is placed on the minion cheese wheel on the story control board. Each time 1 or more cheese symbols are rolled when attacking or defending with a minion, add 1 cheese token to the minion cheese wheel for each cheese rolled. When there are no minions on the board and the last mouse on the initiative track ends its turn, add a cheese token to the minion cheese wheel. Move the hourglass marker one page closer to the chapter end marker along the chapter track on the story control board. Check the chapter instructions. If there is a special surge rule for the room the mice are currently in, follow the instructions. If there are no chapter-specific surge instructions, follow the surge effect on the face-up encounter card that is on the encounter deck and then discard that card. If there are no room-specific surge rules and no face-up encounter card, no minions are placed for this surge, but the hourglass marker is still moved. 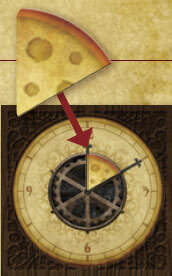 After resolving the surge, remove all cheese from the minion cheese wheel. If a surge requires minion figures to be placed, and there are not enough of those figures available, place as many as possible and ignore the rest. In addition to performing an action, or choosing not to perform an action, a mouse can perform any of the following free actions at any time during its turn. Each free action can only be performed once during a mouse's turn. Free actions cannot be performed in the middle of another action. When performing a share action, a mouse can freely exchange search cards and/or cheese tokens with another mouse that is on the same space or an adjacent space. When performing an equip action, a mouse can move cards from its equipment slots to its pack or from its pack to its equipment slots. Note that a mouse can only have up to 3 non-trick cards in its pack at any one time. If a mouse would ever go over this limit, that mouse's player must choose and discard 1 non-trick card from that mouse's pack. Cards that are in a mouse's pack should be placed in a facedown stack in front of that mouse. Remember, trick cards do not add to the pack limit. Cards that a mouse has equipped should be placed face up in front of that mouse. A mouse cannot have 2 cards equipped that fill up the same slot, with the exception of the paw slot (as each mouse has 2 paw slots). Note that some items fill both paw slots. When performing a level up action for a mouse, a player may exchange 6 cheese tokens for 1 new ability card of their choice. The ability card must match the mouse's class. Choose ability cards carefully as a mouse can only use 1 ability card per turn, even if an ability could be used at different times in a turn. When a minion initiative card comes up in the turn order, each minion of that type will move and battle. Minion turns are acted out by the player who controls the mouse lowest on the initiative track. Minions always act in a very specific way, as detailed below. When a minion's card comes up in the initiative track, all figures on the board of that minion type take a turn, starting with the minions closest to the mice and moving outward. All movement rules that apply to a mouse also apply to a minion, with the exception that minions will always act in a predictable manner and minions ignore the effects of water, red lines, yellow lines, and mousetraps. When moving a melee minion, first roll an action die. The minion can move up to a number of spaces equal to the number result rolled (1-3). Minions will always take the shortest route to the closest mouse in an attempt to move into the same space as that mouse. Minions cannot move onto a space with a mouse if that space is already full, but they will attempt to get as close as they can. If a minion starts its turn on a space with a mouse, it will not move. If 2 mice are an equal distance from a minion, the minion will move toward the mouse that is highest on the initiative track. Ranged minions only move if they cannot 'see' any of the mice on their room tile. For details on seeing, refer to Seeing the Target section on page 11. If a ranged minion cannot see any mice, it will use as much of its movement as necessary to move along the shortest route toward the closest mouse. As soon as it can see a mouse it stops moving. Battling with a minion works just like battling with a mouse, except the minion will attack a specific target. If a minion can attack more than 1 mouse, it will attack the closest mouse that has not been attacked during this turn. If more than 1 of those closest mice has not been attacked this turn, or if they have all been attacked this turn, the minion will attack the mouse that is highest on the initiative track. Sometimes a chapter in the story book will have the mice confronting boss minions. Boss minions are usually a stronger form of some other minion already in the game. Use the figure of that boss's common counterpart to represent that boss on the game board. In the case of a common minion where more than one figure for that minion exists, place a token under the boss's base to differentiate it from other minions of the same type. Note that even though they may share a type with other minions, they are not affected by powers that affect those minions. For example, Captain Vurst is unaffected by any rules or powers that only affect rats. 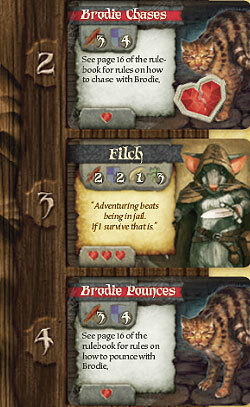 Brodie is the meanspirited tomcat who patrols the castle's common areas and is represented on the board by the paw token. Brodie does not take up room in a space. Other figures can be placed on top of the paw token to share the space with Brodie. When attacking or defending with Brodie, any cheese rolled is not added to the minion wheel. When Brodie pounces, choose the space on Brodie's room tile that has the most figures on it, minions included, and move Brodie onto that space. If more than one space has an equal number of figures on it, Brodie will pounce on the space that contains the figure whose initiative card is highest on the initiative track. 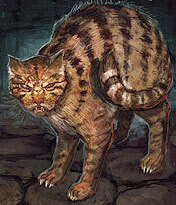 Roll once for the pounce's initiative card. Each figure in that space must defend against that same attack separately. Brodie will pounce on the space he is already on if it contains the most figures or if no other spaces have figures on them. When Brodie chases, roll 2 action dice and total the numbers. The result is how far Brodie is moved on that turn. Move Brodie along the shortest path toward the closest mouse that is not already on Brodie's space. If 2 or more mice are an equal distance away, Brodie will move toward the one that is highest on the initiative track. If there are multiple shortest paths, the players can decide which path Brodie will take. If all active mice are on the same space as Brodie when he starts his chase, he will not move at all. If Brodie has any movement points left after reaching the closest mouse, continue moving Brodie toward the next closest mouse following all the rules above. Once Brodie is done moving, roll a number of action dice equal to the battle value on Brodie's chase initiative card. All figures that are on spaces that Brodie moved along on this turn (including his start and end spaces) are affected by that attack. (Only 1 attack roll is made each time Brodie chases, all affected figures must defend against that 1 roll separately). When a mouse is wounded, place those wounds on the mouse's hero card. If a mouse's wounds are ever equal to or greater than that mouse's life value, that mouse becomes captured. 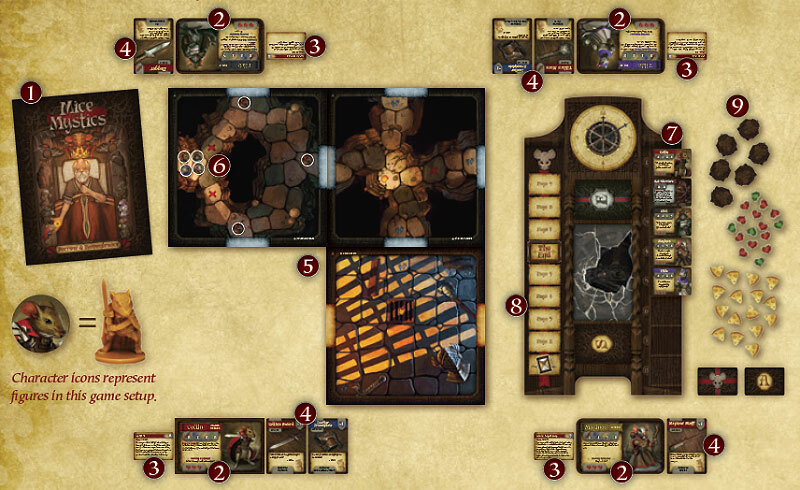 Leave the captured mouse's initiative card on the initiative track, but remove that mouse's figure from the game board, discard all of that mouse's cheese tokens and all of the search cards the captured mouse currently has equipped (starting equipment and any items in its pack are safe and do not need to be discarded), remove all wounds, poison wounds and other negative markers from that mouse's card and move the hourglass marker 1 page closer to the chapter end marker along the chapter track. If a mouse is captured, that mouse is automatically rescued on its next turn as soon as there are no longer minions on the board. Place it on the same space as another mouse or on a space adjacent to another mouse. If there are still minions on the board when it becomes a captured mouse's turn, it cannot be rescued and must skip its turn. On a turn that a mouse is rescued, being rescued takes up that mouse's whole turn. When a mouse becomes stunned or webbed, place the corresponding marker on that mouse's card. A stunned mouse can move normally, but the only action it can take is a recover action. A webbed mouse cannot move or use scurry actions until it uses a recover action to remove the webbed marker. When a figure becomes knocked down, place that figure on its side. A knocked down figure must spend its entire move to get back up. Large figures cannot be knocked down. Knocked down figures can attack and defend normally. When a mouse becomes charmed, place a charmed marker on that mouse's card. When a charmed mouse takes a turn, treat that mouse as if it were a minion during that turn, moving and attacking just like a melee minion. A charmed mouse uses only the information listed on its initiative card, and receives no bonuses for equipped search cards or abilities. Once the charmed mouse finishes its turn, remove the charmed marker from its card. Some wounds can be poison wounds. When placing a poison wound marker, place it green side up. Poison wound markers cannot be healed by normal healing spells and scrolls. They require special antidotes or cure spells. 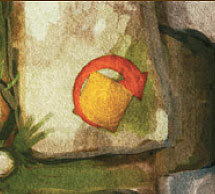 When playing Mice and Mystics, players will choose a chapter to play through from a story book. Each chapter has its own victory conditions. To win the game, players must complete these victory conditions before the hourglass marker moves onto the chapter end marker on the chapter track located on the story control board. We recommend players play the chapters in order.